Chibh-Da’ira means almost circle. This in situ installation is part of the artist’s series of aesthetic recycling and comprised of ninety-nine compressed aluminum foil spheres. 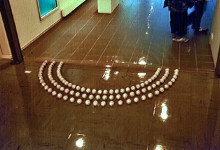 The spheres are arranged in three rows that form three concentric half-circles on the ground.